McIDAS images of GOES-13 0.63 Âµm visible channel data (above; click image to play animation) revealed a well-defined mesovortex moving southeastward across the southern part of Lake Superior during the day on . As the feature approached the Upper Peninsula of Michigan, a secondary mesovortex could be seen to the east-southeast of the larger primary mesovortex. These mesovortices produced bands of heavy snowfall and strong winds (with gusts as high as 60 mph offshore at Stannard Rock, and 46 mph inland at Marquette), which reduced surface visibility to less than 0.1 miles at times. 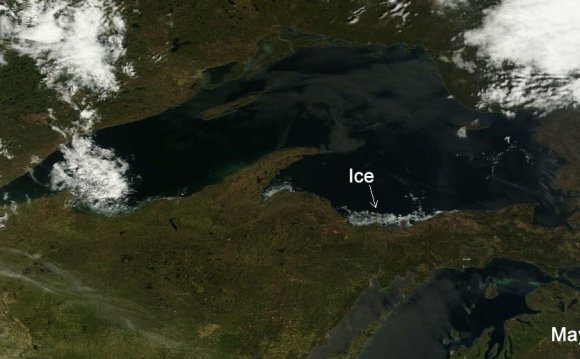 Farther to the south, another item of interest seen in the imagery was the slow eastward drift of ice floes in the northern portion of Green Bay. During the preceding night-time hours, an AWIPS image of Suomi NPP VIIRS 0.7 Âµm Day/Night Band data at 07:24 UTC or 2:24 AM local time (below) showed cloud bands starting to wrap around the mesovortex as it was beginning to form in the northern part of Lake Superior (northeast of Isle Royale). This example highlights the “visible image at night” capability of the VIIRS Day/Night Band (given sufficient illumination by moonlight — in this case, the Moon was in the Waxing Gibbous phase, at 98% of full). An overlay of the 07 UTC RTMA surface wind field confirmed the presence cyclonic flow around the developing mesovortex. During the morning hours, the circulation of the primary mesovortex could be seen on Metop ASCAT scatterometer surface winds at 15:28 UTC or 10:28 AM local time (below). Cloud features associated with the pair of mesovortices could be seen in detail on 16:58 UTC (11:58 AM local time) and 18:40 UTC (1:40 PM local time) 1-km resolution MODIS 0.65 Âµm visible channel images (above) and 11.0 Âµm IR channel images (below). Cloud-top IR brightness temperatures on the MODIS IR images were in the -30ÂºC to -40ÂºC range (dark blue to green color enhancement), indicating significant vertical development of some of the banding structure. Even greater detail can be seen using 250-meter resolution Terra and Aqua MODIS true-color Red/Green/Blue (RGB) images from the SSEC MODIS Today site (below). Regarding the ice in Green Bay, there was a news story discussing the impact of this early ice formation on shipping. Another indication of the vertical extent of some of the mesovortex banding features was the strong illumination of the southern sides of the bands by the low mid-December sun angle, as seen in a comparison of the 18:48 UTC (1:48 PM local time) Suomi NPP VIIRS 0.64 Âµm visible channel image with the corresponding VIIRS false-color “snow-vs-cloud discrimination” RGB image (below). In this RGB image, surface snow and ice (as well as glaciated cloud tops) appear as varying shades of red — in contrast, supercooled water droplet clouds appear as shades of white. Signatures of the twin mesovortices were evident on NWS Marquette, Michigan radar base reflectivity (below). Additional radar imagery can be seen the WeatherMatrix Blog.